It was a dream wedding, Valentine’s Day, 2014 atop a cliffside in Maui, when Megan and Mike made the promise of what they hoped would be a long life together. A long life of travel, that is. Both had been galavanting around the world since 2007. At some point in 2010 they crossed paths, and decided those separate paths might do well were they to merge. Megan is 28. She’s a graduate of Journalism and Law. Mike, now 33, is a wildlife photographer. The two met at the base of Mt. Kilimanjaro after each having recently completed the summit of Africa’s tallest mountain. When pressed further for details, the hows and wheres, the why of it all? Being my own boss means I answer to myself. In their time on the road, the couple has become somewhat famous. They’ve won awards, been featured in publications like National Geographic and The New York Times–to name a few–and traveled to dozens of countries and likely countless destinations over the years, both together and when they were traveling separately. All of that fame and, one might be lead to believe, fortune, might affect many a wandering soul. It seems to have humbled Megan in a way, though. 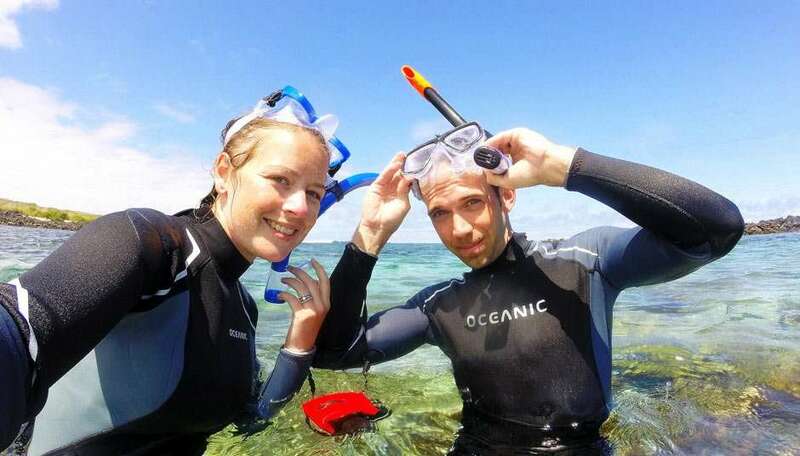 Megan and Mike snorkeling in the Galapagos Islands. Many a traveler with a few notches on their belt will recount a similar tale, where you start to wonder if you’re spending more time behind a camera, a computer screen than actually living the original dream. Her advice for dealing with the uglier side of the web watching crowd? There is a dialogue amongst many a traveler who puts their lives out into the open world, as to their responsibility when it comes to responding to other people, fans or otherwise. The conversation often sways back and forth between valuing the time of those who send their thoughts our way–good or bad–and the traveler’s right to restrict which opinions are shared on their particular platforms. This may seem crass or snobby to those who are curious about such a life, who want more insight, more conversation, but Megan has a wonderfully positive view on the subject. Help those who desire a positive attempt at discourse, and thanks to the nature of the web, remove that which is simply created to destroy. A journalist by trade, a travel blogger through fortune (and no doubt hard work), Megan struggles to find a balance between splashing in the waves and pulling in a paycheck, the joy of travel and income side of it, if for no other reason than the two worlds have become one for her. “When I was starting the blog I was working full-time, so traveling and writing were my hobbies. Then the blog became my full-time income and I quit my job to dedicate myself full-time. She’s clearly passionate about her work, and each breath it affords her. She makes it clear that her goal isn’t to complain, that she’s aware that many people would dream to have their dreams and their jobs coalesce so, “but when your hobby becomes your full-time job, one of the most difficult things is achieving a healthy life balance. 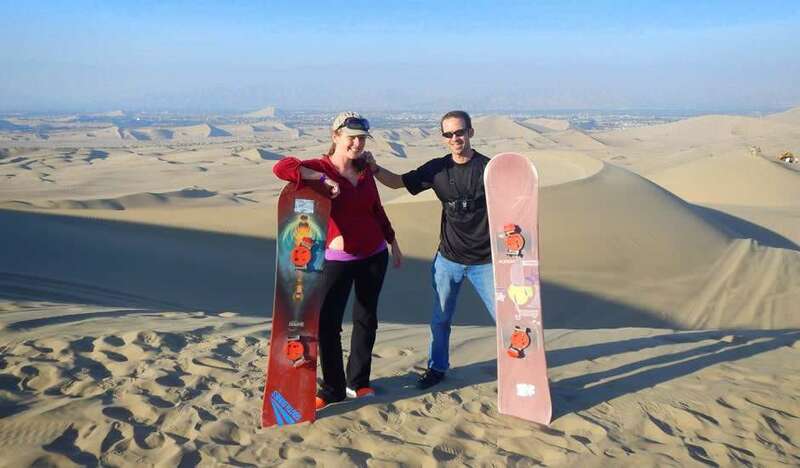 Megan and Mike sandboarding in Peru. She states on her blog that travel has given her a better education than she believes she received from her traditional schooling, but she’s not ready to advocate ditching higher learning in favor of life experience just yet. Even if a formal degree from a university wasn’t specifically a prerequisite to traveling the world, meeting the love of her life, and all of the adventures that have become of that, she believes that our pasts dictate our present, and that we’re a culmination of our previous experiences. What exactly, then, does she do these days? What is the actual role of a travel blogger? As formal education may not always lead to the exact career path you envisioned when entering school, neither has the path to her current career as a traveler necessarily been so clear from the beginning. “When I began blogging one of my goals was to break into freelancing for major news outlets and big magazines.” Makes sense, get the big guys to pay you for the workaday life, just doing it while on the move. While that may sound daunting to a newcomer to the field, it also provides a glimmer of hope. It means you’re responsible for your own destiny. When we have our lives in our own hands, life can be a little scary, and the responsibility doesn’t necessarily end on Friday at 5pm… However, it’s an amazing thing to have your life in your own hands, for boon or bust. If the couple’s bucketlist seems overflowing, even more impressive is their ability to empty it. When they think back on where they’ve enjoyed the most, Iceland and the Faroe Islands simmer to the top of a pot no doubt full of stone soup. “We’re drawn to off the beaten path destinations with minimal tourism, a big focus on nature, wildlife and outdoor adventure, and anywhere which can offer a unique and authentic cultural experience.” Iceland quickly takes center stage in the conversation. Aside from their love of nature, they clearly have a deep appreciation of the cultures they meander through as well. “It’s no doubt that tourism brings many economic, socio-cultural, and environmental benefits, however it is important for us as travelers to be aware of how our presence effects the local communities and environments we come into contact with.” She has no desire to see the places she wants to visit altered, changed irrevocably even, by her impact, or any of ours. Even when a local community’s views conflict directly with their personal beliefs, they remember that part of the reward of what they’re doing is precisely these differences in how cultures perceive the world. She mentions a quote she believes sums it up nicely. Perhaps this open-mindedness is why their dreams continue to grow more quickly than their feet can shuffle them to the next destination. Indeed, the couple is headed to the frigid continent truly “down under” come February of 2017. Those fantasies have lead them to call Australia their personal basecamp. Not to say the adventures won’t continue. Sometimes a change of pace is as exhilarating as the constant change of location, particularly when you’ve looped the world a few times already. As to how all of these years of meandering about the world have changed her? “Saying you’ve ‘found yourself through travel’ has become very cliche, but I do believe it’s true. I say it more so in that my experiences over the last ten years have shaped me into the person I am today, and I have seen my personality evolve and change over time with each new experience I’ve been exposed to. “Should I have stayed put, I would probably be living life in a bubble. Travel offers the opportunity to really open your eyes. You have the chance to meet different people who live completely different lives. You realize that there’s no such thing as ‘right or wrong’ and that a lot of the time opinions are based on cultural perception. What's next for Megan and Mike? You can continue to follow the couple’s world travels via Mapping Megan, or for a true change of pace, look to Mike’s newest endeavor, Waking Up Wild, a blog based on wildlife travel experiences in the natural world.